As Baby Boomers, we mostly feel like we don’t need any more “stuff,” yet we still might like to buy presents for friends or relatives who are in the same boat. What to do if you simply must buy something? For people who have everything, or simply don’t want or need anything else, giving a food-related gift is just the ticket to express your gratitude, appreciation or love. Truly, you can’t go wrong with food. It’s dear to the hearts of every one of us – especially at this time of year… “ ) Here are a few ideas to consider. Let ’em dine and think of you! No, you don’t eat it, but this instant-gratification gift gets your giftee into a place she’d will want to eat. OpenTable Gift cards let you or the recipient personalize the gift precisely to taste – you pick her favorite restaurant or let her make the choice. Ideal for foodie friends and relatives who love new dining experiences. When you purchase an OpenTable gift card (available in denominations starting at $10), pick from the list of 180 restaurants in and around Chicago – or if she lives elsewhere, pick from more than 2,000 restaurants in 30-plus cities. The gift arrives via e-mail, and your giftee can either print it out and redeem it at the restaurant (good any hours the place is open), Or she can just show it to the server on her mobile device. The full amount of the gift is deducted from her final bill (remember to tip on the original amount!). Talk about convenience, and no fees – every penny of your gift counts. Choose from several nice designs and put in a short or long personalized message. Then either send it right away – I love that it comes instantly into her inbox – or set the specific date you want it to arrive. And the fact that you can just carry it on your cell phone or tablet makes it super convenient – no coupons to forget or misplace. 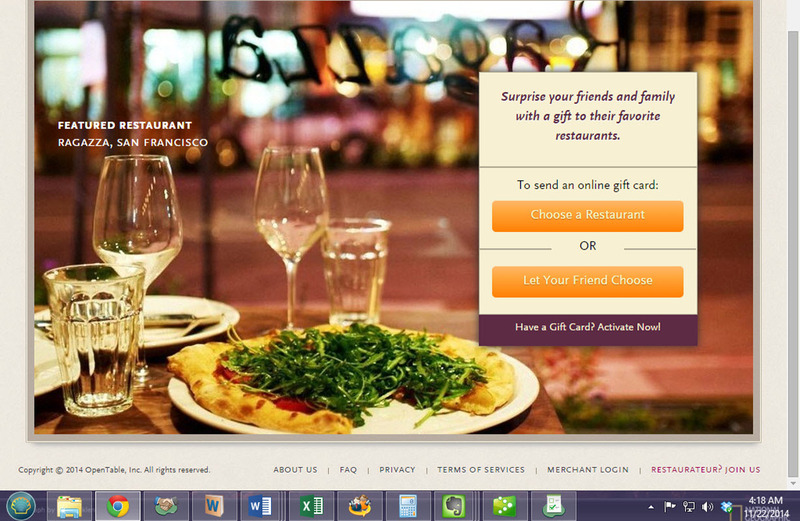 Every year OpenTable is becoming a bigger and better player in the food/restaurant space; this gift card idea beats the generic gift card all to heck. If you love caramel apples, try one of these beauties. 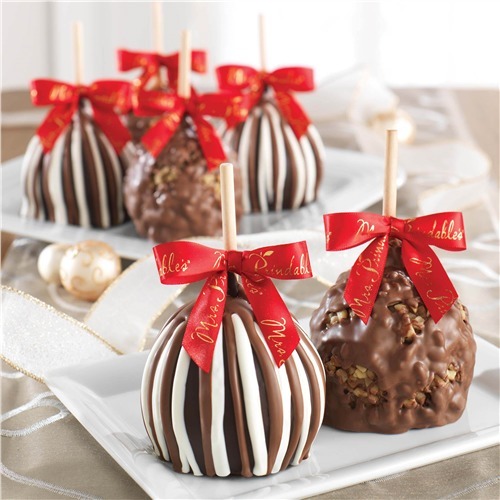 Mrs. Prindable’s uses deliciously crisp fresh apples and coats them with thick, softly chewy caramel and nuts, or stripes them with caramel and dark and milk chocolate, and decorates them to fit the season – e.g., beautiful Christmas or Hannukah trimmings. Their Chicago-style nut-and-chocolate-covered toffee makes a timeless, seasonless gift. You can order basketsful of Mrs. Prindable’s chocolate and caramel goodies of any size, starting at $29.99. Even if you’re watching the budget this year, you can still surprise your giftee with a box of four chocolate-covered caramels for $5.99 or a pack of three chocolate-and-caramel-covered pretzels for $7.99 – though if you don’t want to pay shipping [$10.99 for that $5.99 item), you can pick up your order in Mrs. Prindable’s Factory Store, 7425 Croname Rd in Niles. While you’re there, check out the dark or milk chocolate Nut Clusters, the Truffles and the endless combinations of boxed delights. These goodies are beautifully packaged in beribboned packets and boxes. The apples I tried arrive still cold from refrigeration, so don’t worry they won’t hold up with shipping. Holiday Ballotin ($50 – 36 pcs) – The GODIVA signature assortment of classic Belgian chocolates (caramels, ganaches and pralines) presented in the gold box tied with a red ribbon. Limited Edition Holiday Chocolates & Truffles Collection ($50 – 12 pcs) – All-time favorites mixed with limited edition holiday chocolates and truffles like Gingerbread, Eggnog and Raspberry Linzer Torte. Signature Truffle Gift Box ($50 – 24 pcs) – Select from the full truffle line, adorned with a red ribbon. 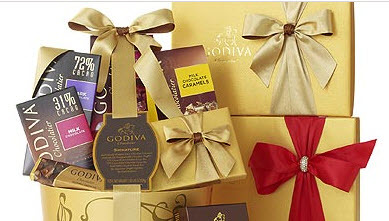 Hot Cocoa Gift Set ($20 – 12 pkts) – GODIVA cocoa packets (three milk, three dark and three caramel). Just in time for the holidays, Hyde Park welcomes a pop-up Amy’s Candy Bar store, 1546 E. 55th St., to go with the original Lincoln Square location, 4704 N. Damen Ave. Hand-crafted confections at the new store include Orangettes (dark-chocolate dipped orange peel), almond toffee covered in dark chocolate and sea salt, meringues, and signature caramels dipped in dark chocolate and sprinkled with a new variety of gourmet salts. Storeowner Amy Hansen graduated from the French Pastry School and trained under renowned chocolatiers Regis Bouet and Lionel Clement. Her handmade treats are made with premium ingredients including European-style butter, organic cream, Madagascar vanilla, Belgium chocolate, and fresh fruit purees. The OMG Bar – hazelnut praline sandwiched between salted caramel and milk chocolate ganache – had Food & Wine Magazine hailing Hansen as a “candy making genius,” and named hers one of the five best candy stores in the country. Amy’s Candy Bar in the Hyde Park Shopping Center (612.269.0970) is open Tuesday-Sunday from 11-7. Lincoln Square is open Monday, 3-7, Tuesday-Saturday, 11-8 and Sunday, 11-6. 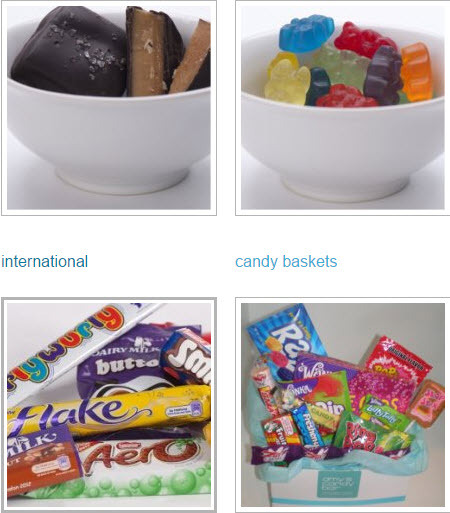 For more info, visit amyscandybar.com.